Ever wondered how an Anti Aircraft Missile works? A plane can move at different speeds and altitudes, so how do you know when to fire your missile? Well you need to know two things: where the aircraft is now and where it will be a short time in the future. The reason you need to know where it will be in the future is because your missile takes time to reach the plane’s altitude, so you need to aim at where the plane will be, not where it is now. Engineers use a nifty thing called the Kalman Filter in order track objects and predict where they will be. The Kalman Filter isn’t just used for missiles, it also plays an integral role in GPS, self driving cars, auto pilot, AI and robotics. What is this Kalman Filter then? It’s a recursive way to use Bayes’ Theorem. What’s Bayes’ Theorem? It’s a useful tool in probability. What’s probability? Read on, you’ll find out. This post therefore describes some basic probability, what Bayes’ Theorem is, what the Kalman Filter is and finally how it is used in an Anti Aircraft Missile. Nothing I describe here requires maths knowledge beyond A-level (or even GCSE) as i’m giving a very broad overview of the whole process. But hopefully after you read it you will have learnt something new. So I can distribute my certainty, or area in the box, how I want. If there are three outcomes I can distribute my certainty: 0.3, 0.6, 0.1 or 0.9, 0.1, 0 or if you were completely certain that the first outcome would happen 1, 0, 0. 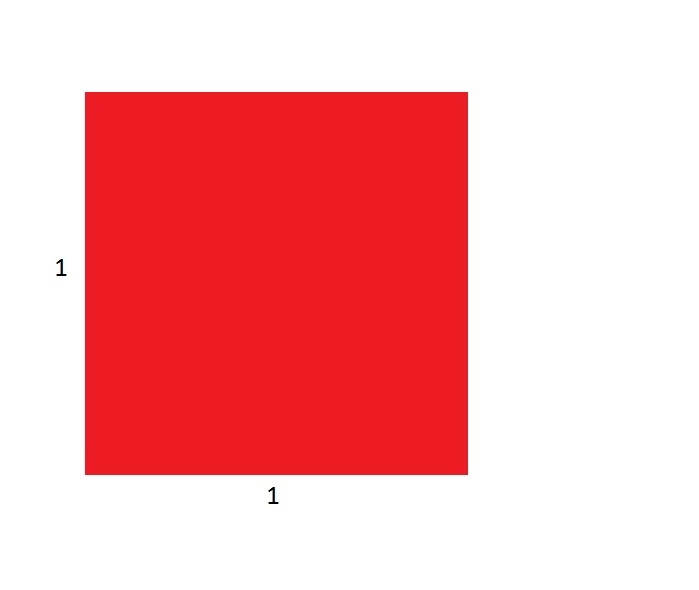 The one rule about the box is that the area must always equal 1. 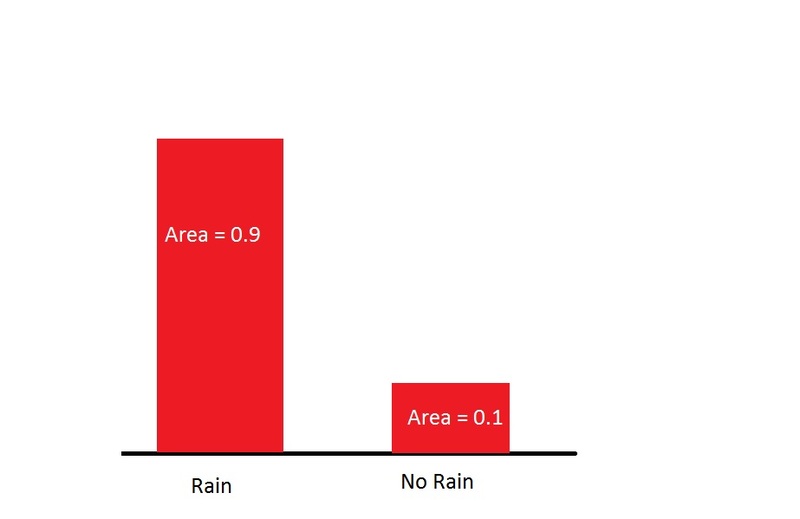 When you are estimating a coin toss or rainfall you are distributing your certainty into discrete outcomes, this means you are separating your box into different segments of different sizes. You separate your box into two other discrete boxes, rain/no rain, heads/tails. As well as discrete outcomes to events, there are also continuous ones. When there is a continuous outcome you don’t split your box of certainty into smaller boxes, you mould your box into the shape of your certainty. Sound weird? It’s not. The next example will make the difference clear. See how the area is still 1? The range we’re given with the better sensor is more narrow, so the box must be higher. When the outcomes were discrete, our certainty was measured by what area of the box we gave to certain outcomes. In continuous outcomes (like the graph above) we still use the area of the box to measure certainty, but we now need to measure the area in a range. Let’s say we want to measure how certain each sensor was that the object is between 2-2.05 metres away. On the good sensor the height is 10 and the width is (2.05-2=) 0.05 metres. So the area of the box is 10×0.05= 0.5, which means it is 50% certain the object is within that range. On the bad sensor the height is 1 and the width is still 0.05, so the area of the box is 1×0.05=0.05. 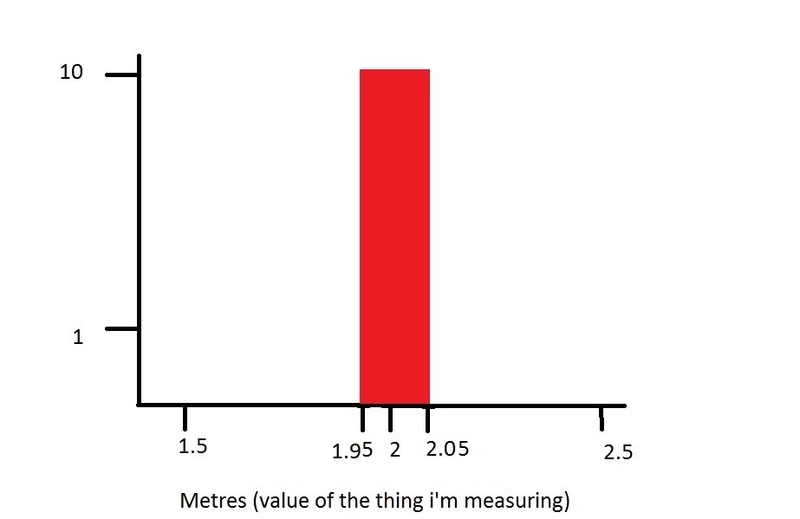 It is 5% certain the object is within that range. In the real world a sensor that measures distances doesn’t give you a range, but an exact value. However some sensors are better than others, so we still need a way of quantifying how good a sensor is. So what shape accounts for these two facts and still gives us a good way to shape our probability? A bell curve! Okay enough about bell curves and certainties. 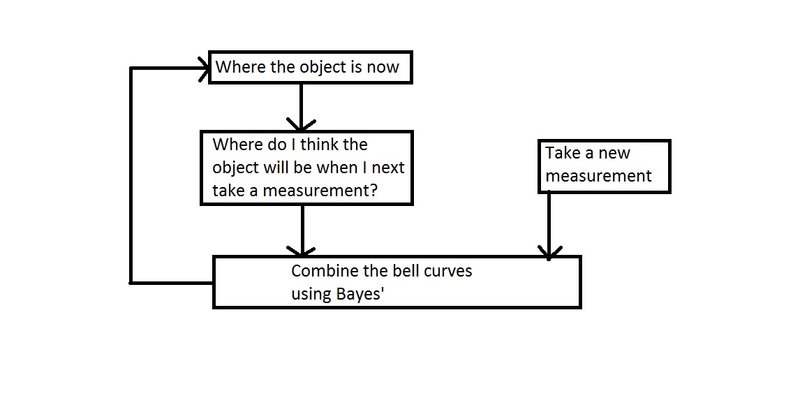 Let’s move onto Bayes’ Theorem and see why it’s useful. How do we infer the distance now? 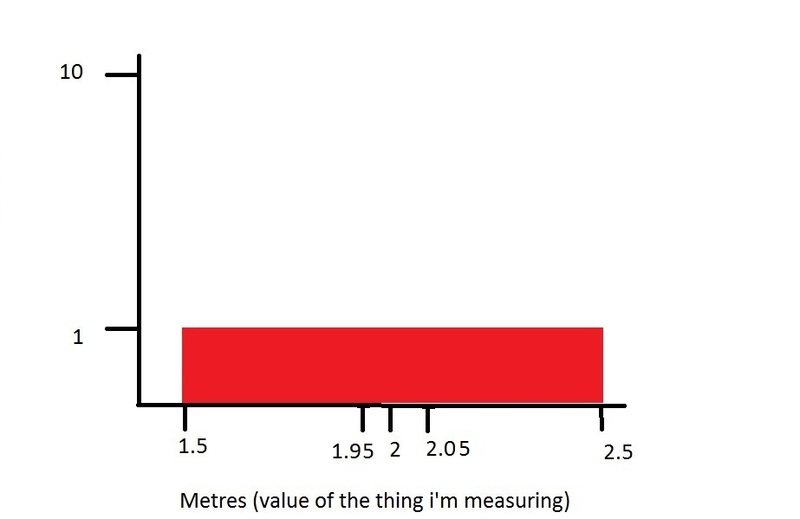 The blue curve is more certain, so surely our result should be closer to 2 metres than to 3 metres. Bayes’ Theorum helps us calculate what the ‘actual’ distance is from lots of measurements from sensors of different qualities. It does this by giving us a new bell curve. This is really useful because it’s condensing information for us. 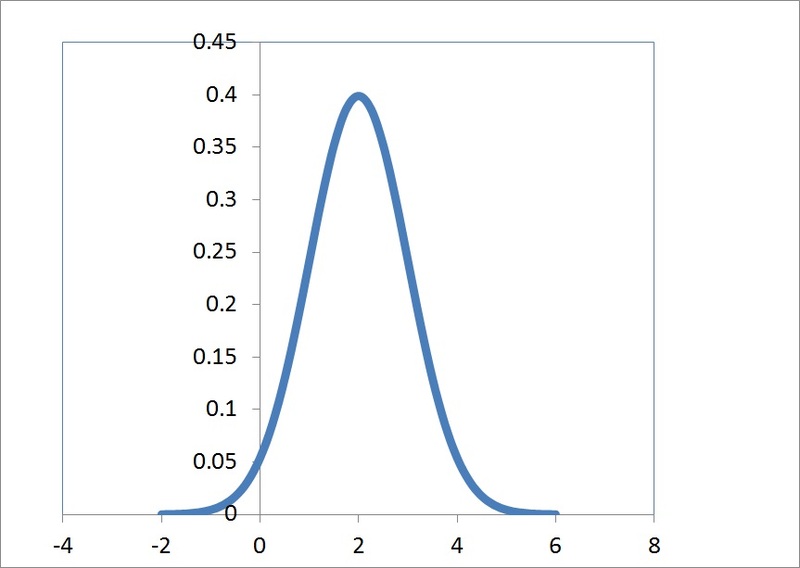 We are given a load of bell curves and are given one bell curve as a result. 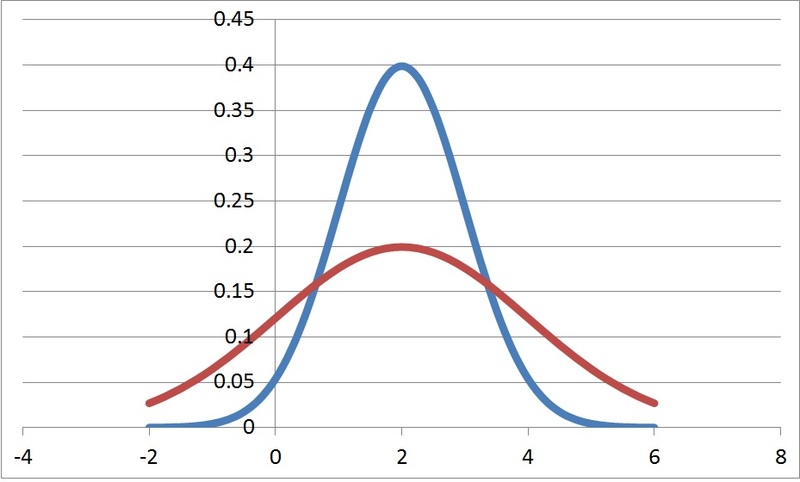 Remember a bell curve needs two bits of information to be defined, mean and variance. 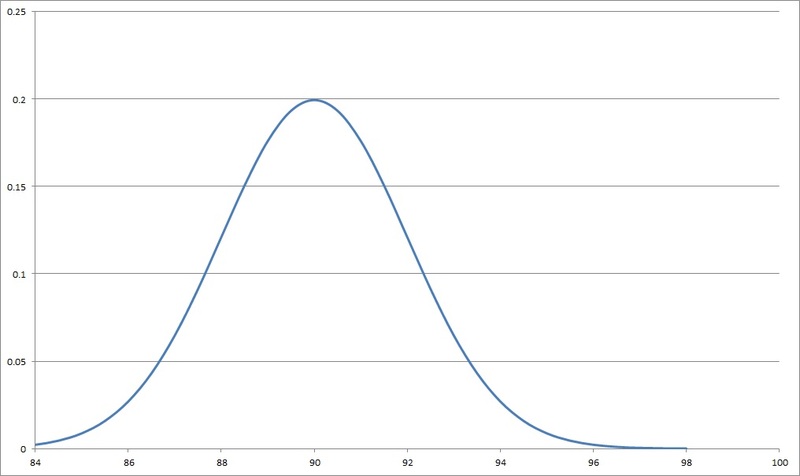 The mean of the new bell curve moves around based on where the mean of the old bell curves are. Think of it like a vote. Each sensor casts a vote on what it thinks the measurement is, but the better sensors have a more influence in their vote. Bayes’ Theorum counts up all the vote and takes the best guess at where the mean for the new bell curve is. What happens to the variance? Interestingly it ALWAYS decreases, i.e. the new bell curve you get will have a smaller variance than the old bell curves you used. 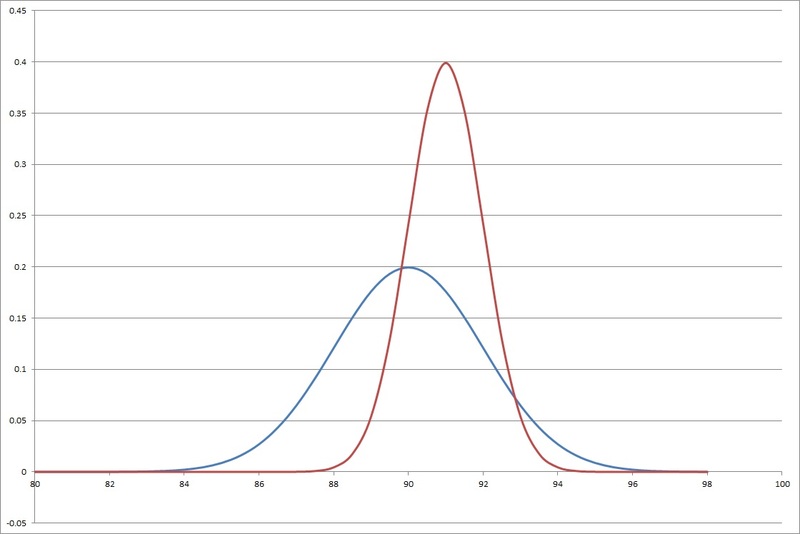 This means that the new bell curve you have will always be more certain of it’s value than the previous bell curves. This translates to: The more information you have about something the better. You can never be given more information about something and be less certain about it’s value. It seems obvious, but it has interesting corollaries (perhaps for another post). This is better than only using the measurement from the radar. Using information about past measurements lets us take an extra guess at where the ball is. Remember if you have more information about something the better. The Kalman filter is a really effective way of using the past to inform the present and predict the future. Lets wrap this up by giving an overview of how an Anti Aircraft Missile works. It’s almost the same as the example of the ball moving towards the radar, but more tailored towards missiles. Your missile can shoot vertically up into the air. If a plane passes over your missile station, you want to fire the missile so that it will come into contact with the plane. You have a few radars that are tracking the plane and they take a new measurement every 0.1 seconds. You also know how long it will take for your missile to reach a certain altitude. Say the plane approaching your station is flying at 30,000ft and you know that it will take your missile 10 seconds to reach that altitude. You use the Kalman Filter on the radars in order to track where the plane is and it’s speed. But the Kalman filter can also make predictions about the future position of the plane. So you not only plan 0.1 seconds in advance (the amount of time it takes for the radar to take a new measurement), but also 10 seconds in advance (the amount of time it takes for the missile to reach the appropriate altitude). When the prediction 10 seconds in advance says that the plane will be vertically above the missile, you shoot. As the plane is already being tracked, figuring out the altitude of the plane is as simple as looking at where the Kalman Filter thinks the plane is. So if the plane is at 20,000ft and the missile takes 7 seconds to reach that altitude, the Kalman Filter will predict 7 seconds in advance. It’s easy to write a program that will do this automatically without any human input. What if the plane is changing altitude? The problem becomes slightly harder, but not too hard. It’s just a matter of figuring out how far to plan in advance. In this post i’ve described what a Kalman Filter is and hopefully you’ve understood the potential of it. To get there i’ve gone through how to represent probability and Bayes’ Theroem because I believe you get a deeper understanding of the whole process if you have a grasp of these. That was great, it is one of the best explanations of probability I’ve ever read. Please keep on writing those excellent articles ! Great article, can be easily understood – hope you keep up the excellent work! Thanks for this excellent read! Again, your use of vocabulary is what makes concepts clearer. I will henceforth refer to Kalman Filters as “Kalman Trackers” (and attribute any credits for that to Mr Dallas). I’m a college freshmen and I’m loving your top-down explanations. Thanks! I enjoyed your explanations, very precise and easy to digest. Thanks for the incredible article. Hope you keep writing about this stuff. Beautiful article. Extremely well written! Interesting article…. Well written in simple language. Thanks, what is the specific principal of Bayes Theorem that will render a new gaussian from multiple observations? I’d like to prove that to myself. Thank you so much for sharing your knowledge! It’s really helpful to me since now I understand why I should keep learning Calculus. Hi, your website is really good. I truly do appreciate you sharing helpful posts. Very good, I however didn’t really catch how you calculated the x+1 bell curve. 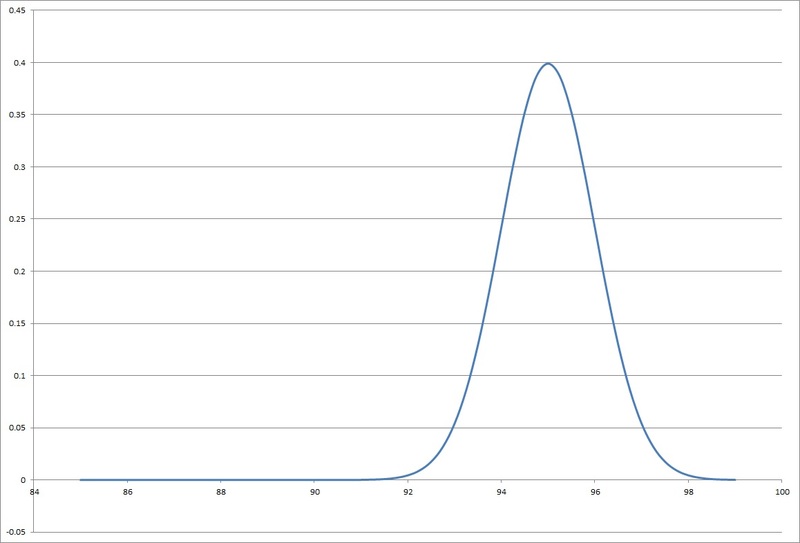 I understand that it must have wider variance (logical) but how does one calculate that specific bell curve? Just to clarify, I’m meaning the prediction of x+1. To calculate it you make an assumption about the speed of the ball. In our case that assumption is that the ball is going at a constant speed. You’ve also got to guess how good that assumption is (for somenm things this will be more accurate than others, the assumption is also better if you take quick measurements). 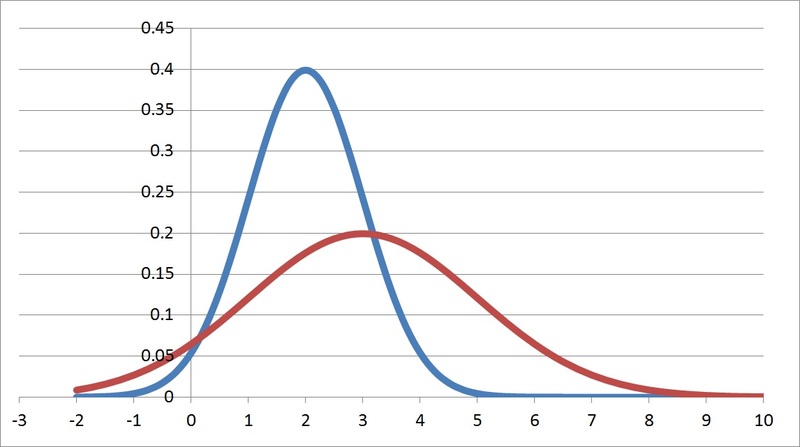 Based on this you can calculate where x+1 will be (the mean) and your guess at how good the assumption is determines how much the variance grows (this ‘guess’ is often a trial and error process, part of ‘fine tuning’ the filter). 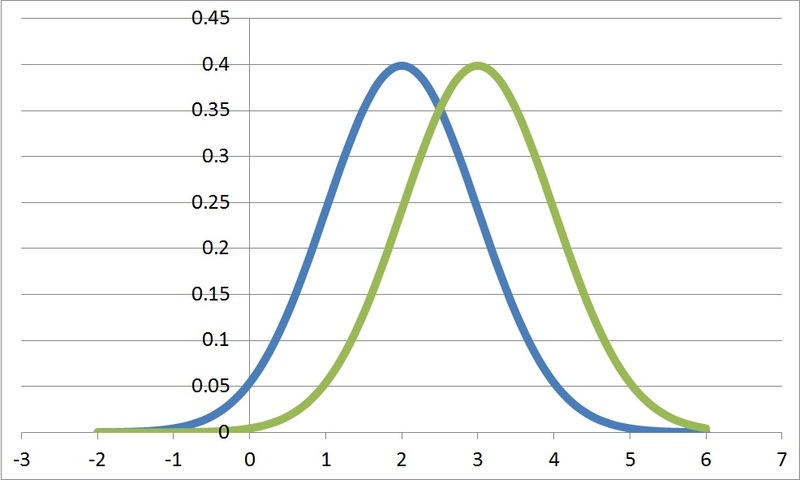 The mean and variance are then calculated and the bell curve for x+1 can be drawn. Hope that helps? Amazing way to tell complex concepts in a simple way!! PhD in controls. Never really understand Kalman filter. Shame on my PhD degree. I have lost my confidence in controls for a long time. Thank you for helping me to take it back.